The first two months of wedding planning are typically dedicated to the foundation of your wedding. Deciding on a date is probably your biggest hurdle. Of course, with the risk of unavailability, it’s best to come up with a backup date. Most couples rather skip over the next step and go straight to cake testing, but setting a budget is essential in the planning process. Whether it is just you and your partner, or your family is chipping in, you have to land on a number that you are comfortable with. You don’t want to go into debt to say I Do! After the big decisions have been made, you can move onto the things that are more fun like creating a Wedding Website. With this, you can share information with guests and provide an organization center for yourself. Check into venues and compare after visiting each of your options. Then, start assembling your team of professionals such as photographers, videographers, florists, caterers, decorators, etc. Not only can they make your dream day a reality, but their experience will make the planning process easier as well. Utilize planning boards such as Pinterest to narrow down wedding themes and styles. Check out Stambaugh Auditorium’s Pinterest board and follow us for great ideas and tips from our staff and clients. At ten months, it’s important to take your ideas that you’ve gathered and start to make concrete decisions. At this point you can choose your Bridal party attire, giving everyone plenty of time to be fitted. 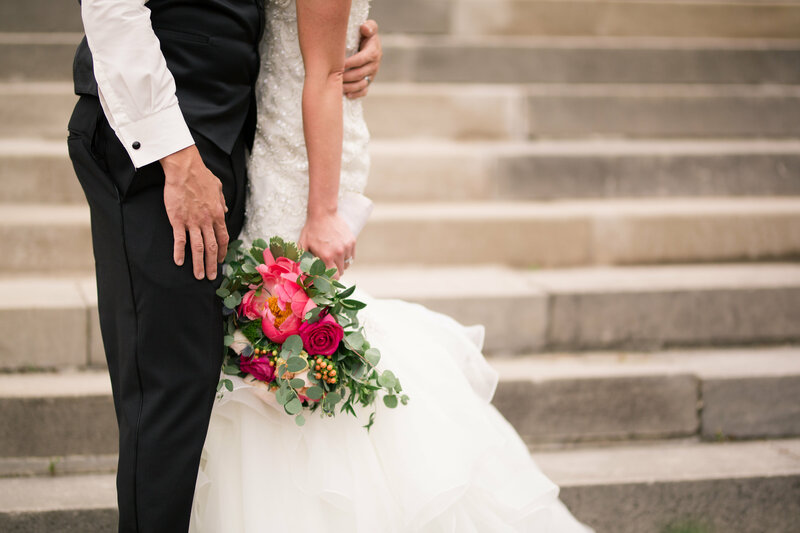 Once you’ve run the pros and cons of each of your venue choices, the ten-month mark is a good time to reserve your venue before someone else selects your date. With the venue reserved, now you can mail out those adorable save the dates and focus on the dream dress. Eight months to go! Your venue and event coordinators will be happy to recommend hotels for your out of town guests. It’s recommended to reserve a block of rooms if you are planning on many out of town guests, most hotels will offer a discount code too! If you have not settled on your invitation design yet, you might want to lock that in. 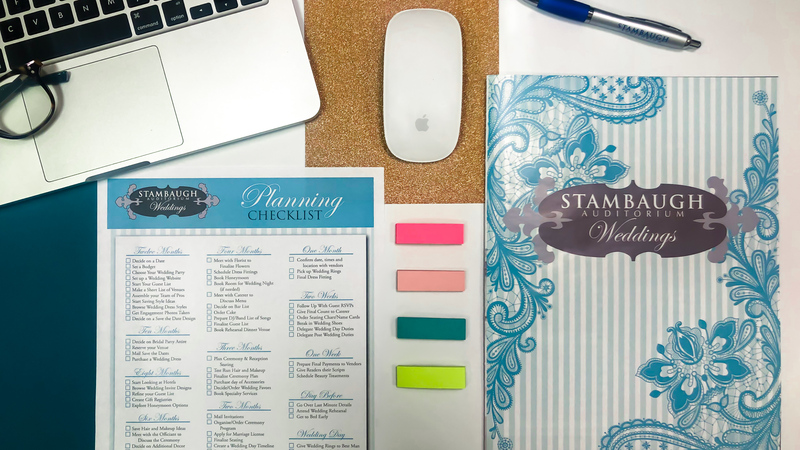 Along with your invitation, you might want to think of ordering other pieces of your stationery (thank you notes, signage, ceremony programs) at this time to ensure a match. Other things you are going to want to think about are refining your guest list, creating gift registries, and exploring options for honeymoon locations. Six months from the wedding, you should be deciding on additional decors such as linens, chairs, etc. and saving ideas for hair and makeup. How are you handling music during your ceremony? Are you planning on booking a musician, or does your DJ/Band provide music for the ceremony too? Now is the time to answer these questions. Check with the hotel for your out of town guests, and reserve shuttles to and from the wedding venue if the hotel does not provide any. During this time the Groomsmen attire should be chosen, Wedding invitations should be ordered, and the rings should also be purchased. As we get closer to the big day, there are a lot of small details to keep track of. At this point, you should have solid decisions made for flowers, your honeymoon, the bar list, the cake, etc. It’s also important to book a room for the wedding night if it is needed. Have you met with your DJ/Band yet? It is helpful to prepare a list of songs that will either be a big hit or are on the no-no list. The guest list for the wedding should be finalized and you will also want to think about who will be attending the rehearsal dinner. If you haven’t already, book the rehearsal dinner venue. With three months to the wedding, the ceremony plan should be finalized. This includes the order of the ceremony and whether you will have readers and readings during your ceremony. You should take this time to purchase any “day of” accessories for the wedding such as a guest book or flower basket. Do you want to offer your guests favors? If so now is the time to choose and order them. Any specialty services in mind? Photobooth? S’mores bar? It is time to make sure those details are all in order. Tick-Tock…two more months! This time should be spent on ensuring important details. The first of which is that the wedding invitations are mailed. Don’t forget to include your partner, finalize your guest seating together, make sure you are both getting your “must haves”, and of course get your marriage license! Another thing to talk about together is what traditions do you want to include? 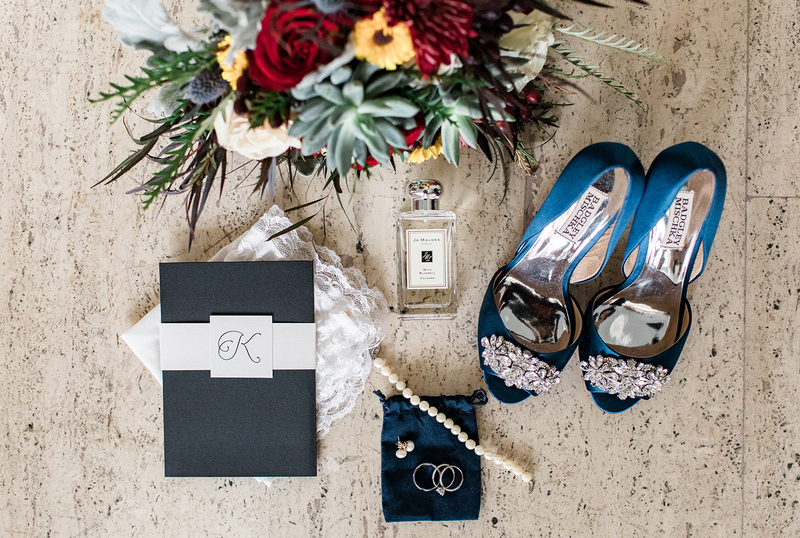 Will you be seeking something new, old, borrowed, or blue? Nervous yet? Coordinate with your vendors to make sure you are all on the same page with dates/times. Waiting any longer to check on these things could put you at risk for a wedding with no food! At this time you should also be gathering the wedding rings and have the final dress fitting. If you haven’t heard from certain guests about their attendance, take this time to check. The final guest count should be given to the caterer and a seating chart can be developed. 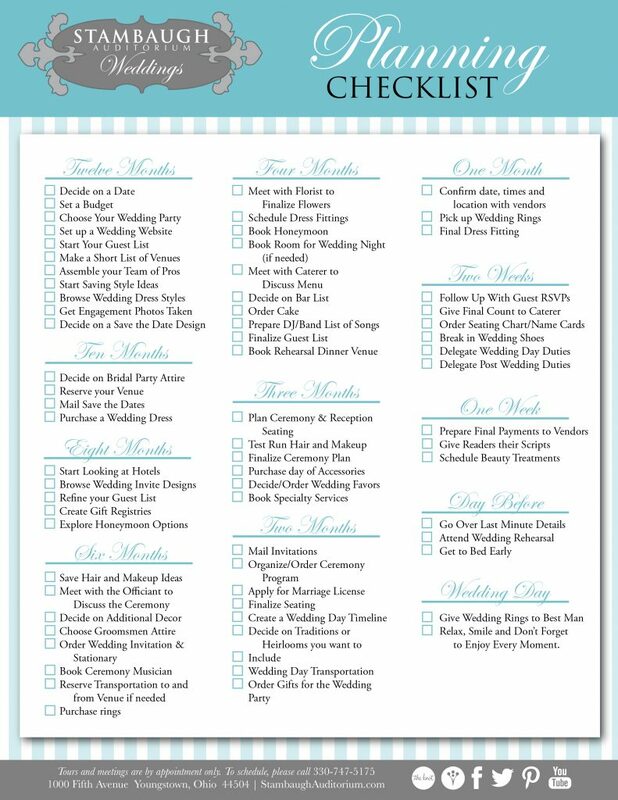 There are also details such as the wedding day duties that should be sorted, like who will be handing out programs. It is also important to assign after wedding duties such as returning tuxes and so on. One week and counting. You should be finalizing payments to the vendors. It’s recommended that in these times you get together with vendors and discuss any questions or finalize any small details. The readers for your ceremony should be given their scripts to practice, and you should schedule and beauty treatments for you and your bridal party. Are you ready? To reduce stress go over any last minute details and double check that everything is ready. Refer to the checklist to ease your stress. On this day you will also attend the wedding rehearsal and do as much as you can there to make yourself feel comfortable for the next day. At the end of the night, be sure to head to bed early and be well rested for the long day ahead of you. Relax, Smile and Don’t Forget to Enjoy Every Moment. The day you have been waiting so long for is finally here! 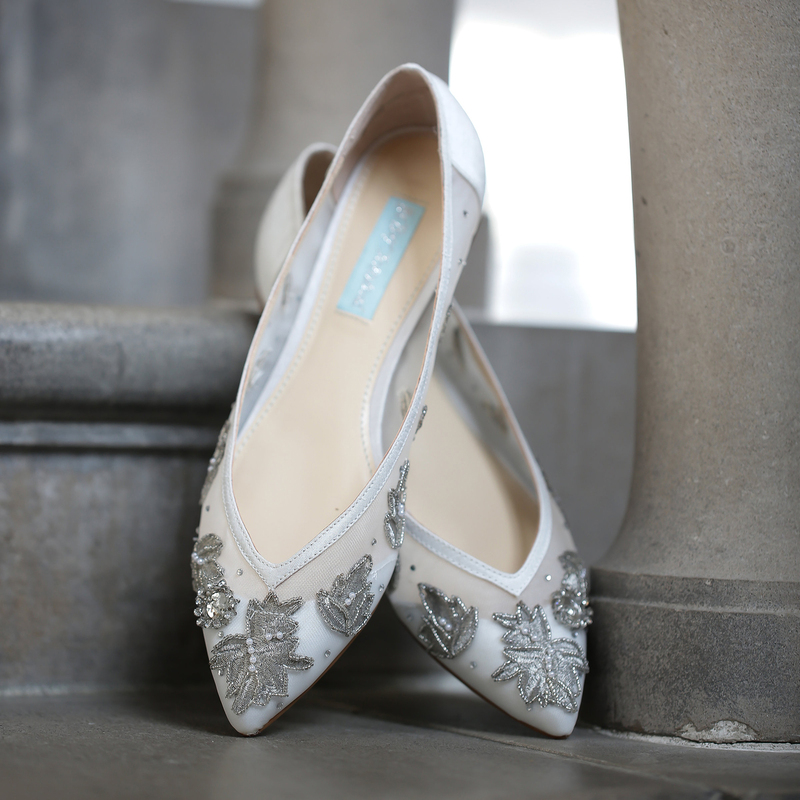 Remember to deliver the wedding rings to the best man, then enjoy your day! All of the boxes are checked and the only thing left to do is experience your day. Smile a lot, relax, and live in the moment with the person you’ll be spending the rest of your life with. You earned it! PrevPreviousCongratulations, You’re Engaged! Now What? I will share it with my clients.